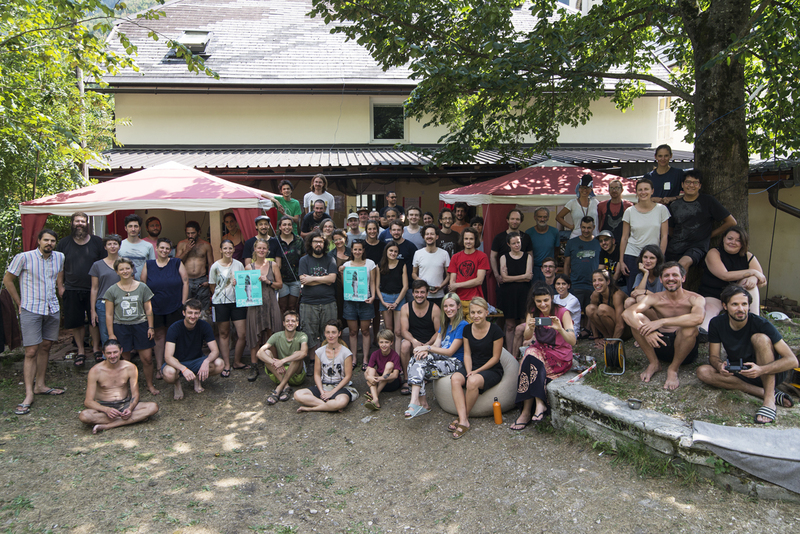 International summer hacking camp PIFcamp is returning to beautiful Soča village between August 4 – 10 2019 for the fifth time! Save the date and stay put for the upcoming open call. 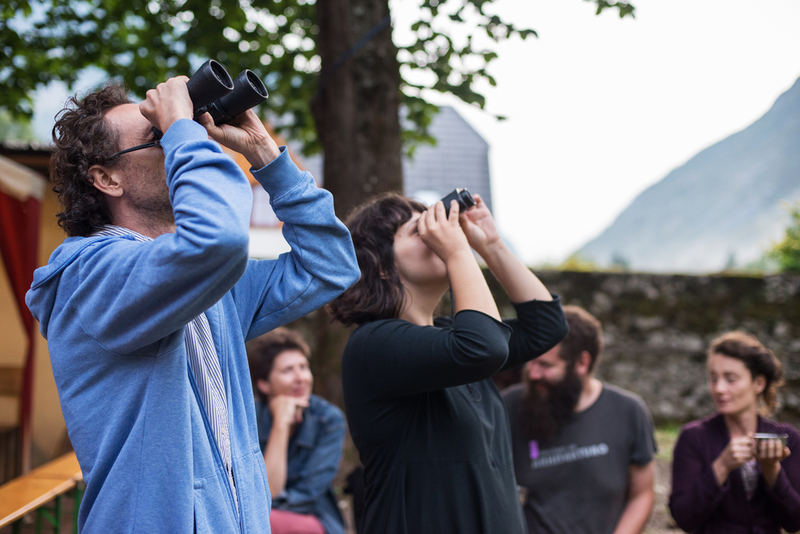 PIFcamp is part of Feral Labs Network, which is co-funded by the Creative Europe programme of the European Union. It seems like the latest PIFcamp, well, its amazing participants, produced more sound related projects than we anticipated! 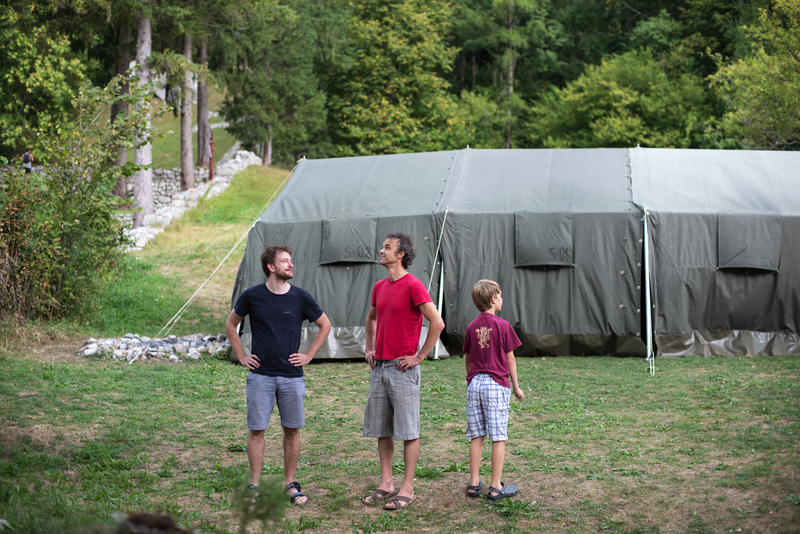 We are re-posting some of them so you can all take a sound trip down the Soča memory lane. 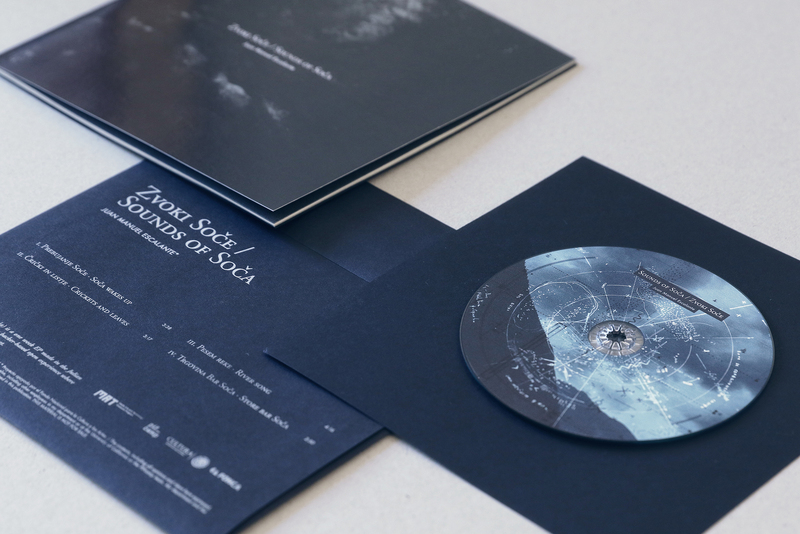 Zvoki Soče is a one week project made in the Julian Alps during PIFcamp 2018, featuring field recordings, electronic sounds and visual scores. During PIFcamp Yanoosh was working on an audiovisual project where his hearth is used as an instrument. 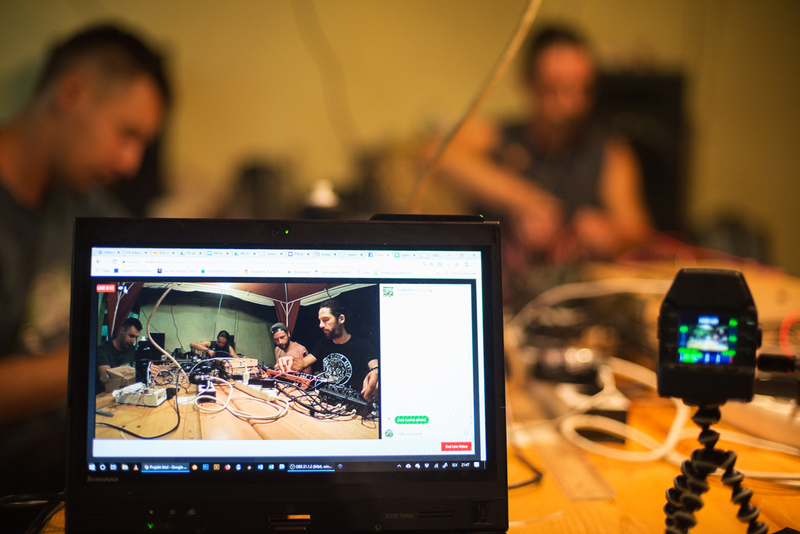 In Ictus Cordis the artist explores the application of the biofeedback method or a mutual heart reaction to the stream of a sound composition as an artistic inspiration. 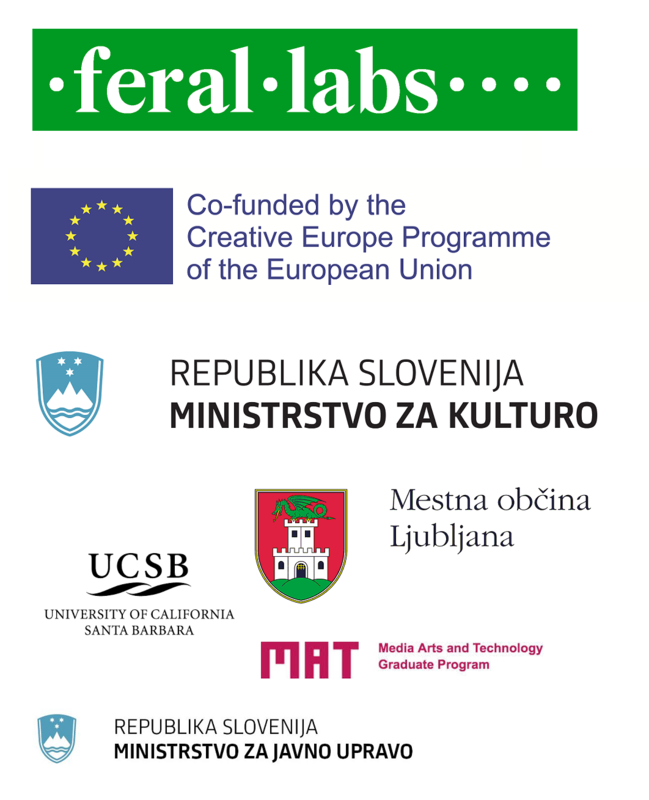 The project was presented in Ljubljana on 24, 25 & 26 November. The envisioned and realizable PIFprojects are about to be completed. Another contribution to the long list is the Library of Missing Parts and Inclusive Circuits, a humorous database of missing graphic representations, which illustrate our relationship to technology. 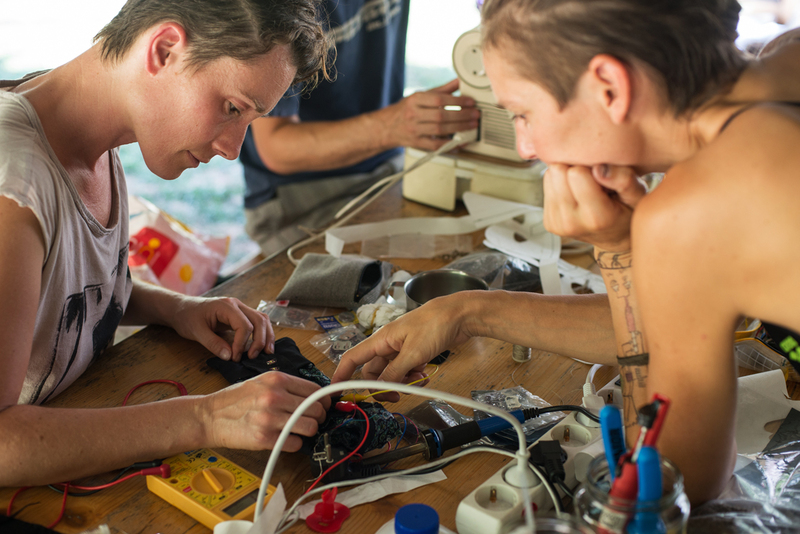 The sensor building workshop led by Hannah and Vaclav is going along nicely. 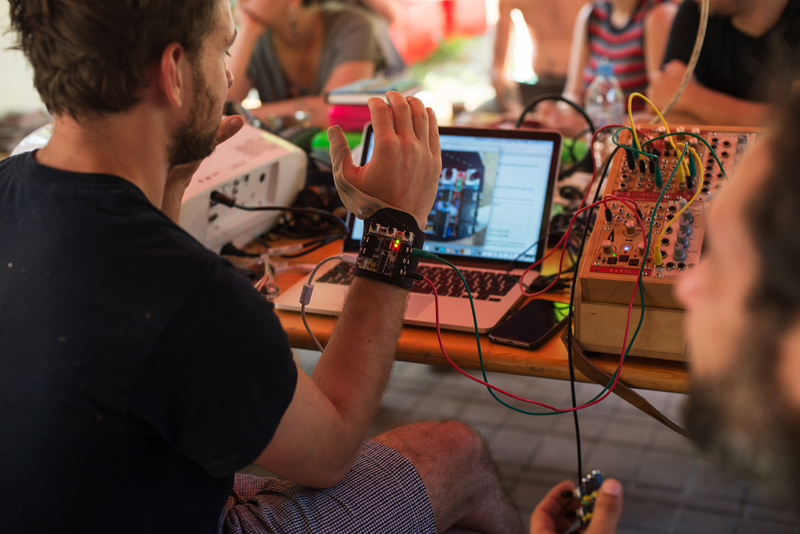 We managed to build several sensors from textiles, which will sonify our work through modular synthesis. Klemens Kohlweis is another artist who made it possible to listen to our immediate surroundings. He used several parabolic microphones to isolate and amplify selected sounds at great distances. The sound of wind takes center stage in Juan Duarte’s project Aeolian Artefact. 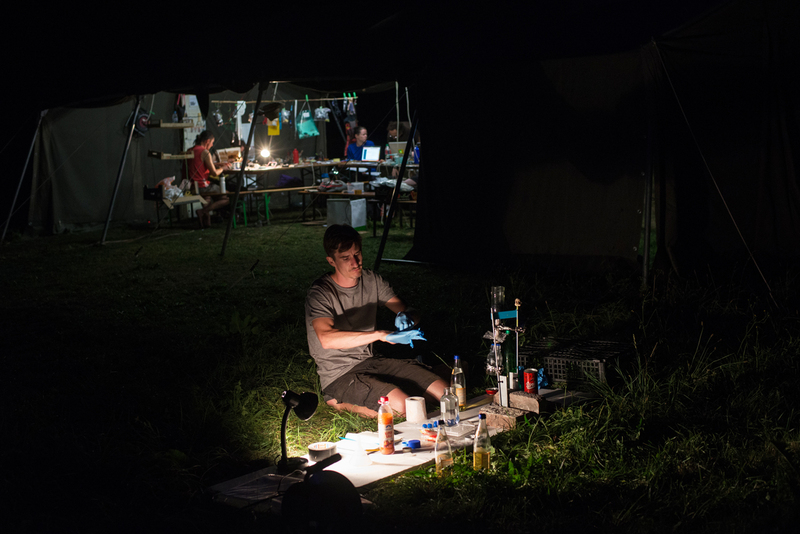 Januš Aleš Luznar (Yanoosh, Ohm Fat) is also fast approaching the rhythm of his heart with the help of two stethoscope-looking microphones he built at the camp. 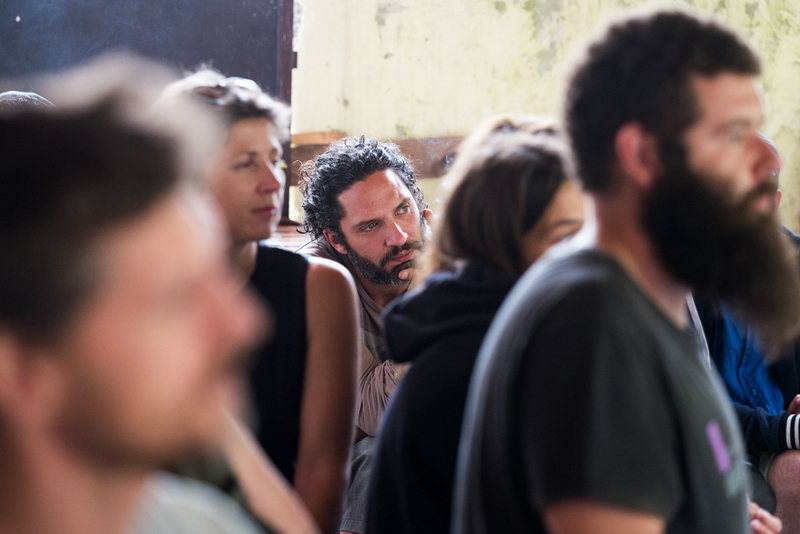 Two participants, both working at the intersection of sound and visual art are Connor Haynes, an audiovisual artist from UK and Juan Manuel Escalante, best described as a nomad. 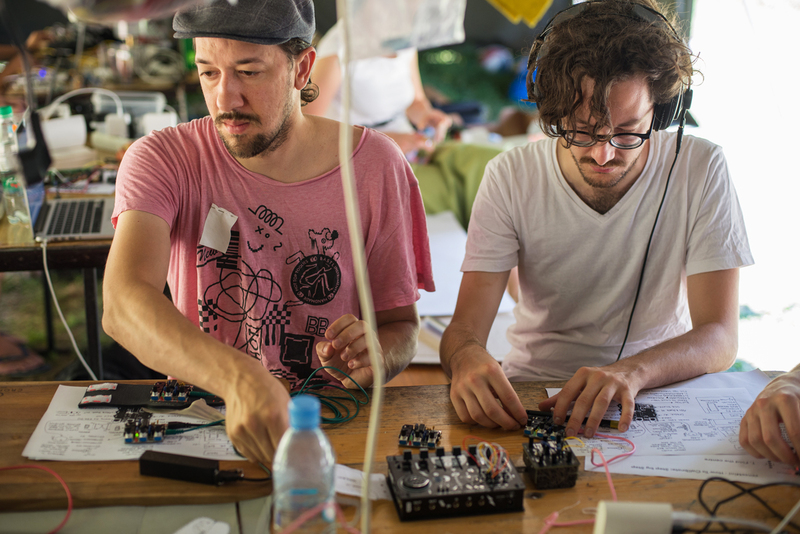 Both were making field recordings in places around PIFcamp, manipulating them and producing accompanying visuals. Escalante envisioned a graphic album and created a series of refined artwork, which reveals various locations where he made the recordings. He considers releasing the project in a fanzine form. 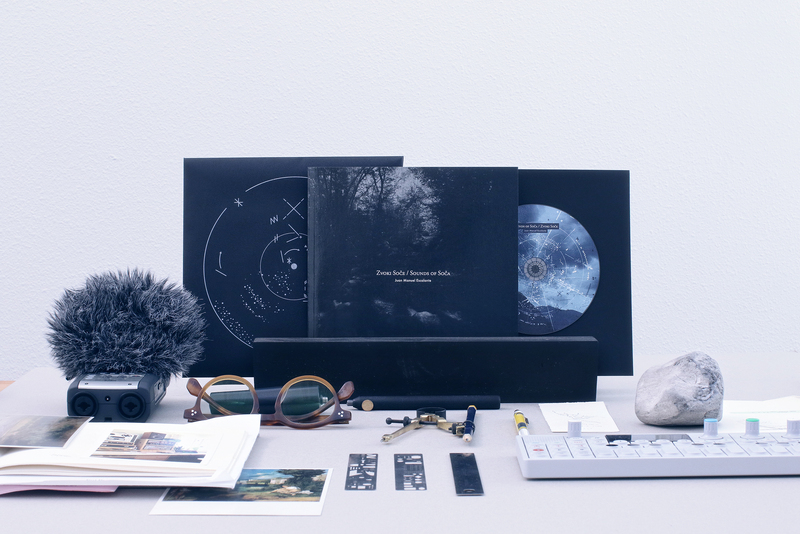 The Slovenian visual artist Tisa Neža Herlec focused on the sonification of her drawing table, which she managed to accomplish with a few contact microphones. Music and sound also drive the Sonance Garden interactive installation by Ina Thomann, an Austrian artist working under the artist name Lino Leum. She will be able to manipulate the sound in the installation by changing the degree of light, moisture and temperature. We are also trying to grasp the concept of time. For Anna Sircova, a psychologist working and living in Denmark, time has been the subject of intense research. An enticing glimpse of the future is provided by Jakob Scheite and his Fortune Telling Machine. A sample of a donor’s urine is used to measure concentrations of the donor’s hormones and these measurements collectively are used to predict an individual’s future. 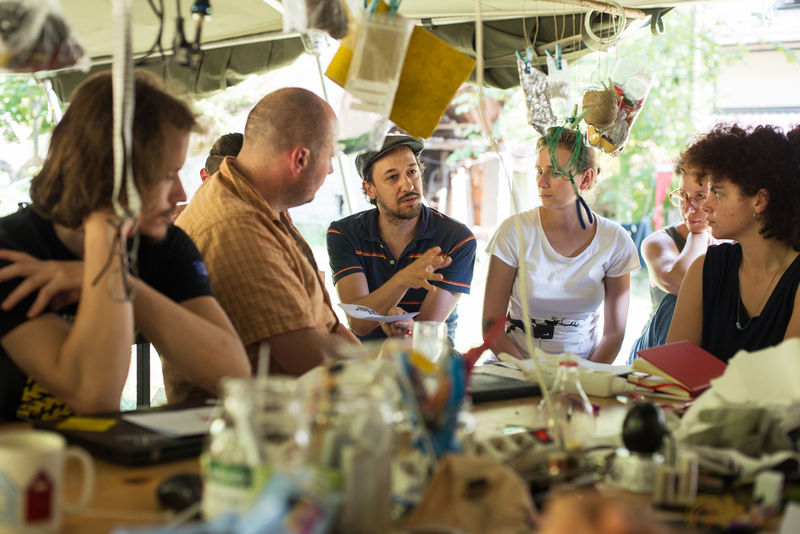 PIFcamp is nearly finished, which means the grand finale is at hand – the traditional Open Saturday! Join us, meet this year’s participants and check out the projects we were developing during the past week. The programme will start around 1 PM, and will continue late into the night. Food and drinks will be available – for a small contribution you won’t be hungry or thirsty, but we would kindly ask you to find your accommodations else where. There comes a point in the day, when each PIFparticipant has to step away from his project, let go of technology and de-stress, usually by the river. There, in a mysterious location, if you are adventurous and curious enough, you can stumble upon the The Wandering Cafe, and enter a charming world full of stories, magical delicacies, as well as receive an obligatory and invitingly comforting cup of coffee. 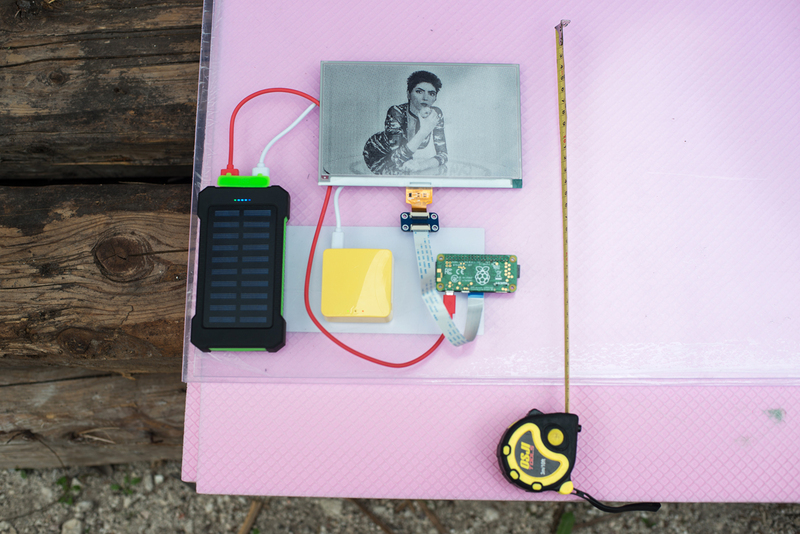 Its proprietress and initiator is Lynne Bruning, the American maker and e-textiles innovator. Another mandatory PIFstop is Krn Lake. There’s simply nothing better to reset one’s brain other than a two-hour stroll up to the largest of the Slovenian high mountains lakes. A simple gravel road takes you trough a luscious forest up to a mountain lodge where the prospect of surrounding peaks is simply spectacular. This view was enjoyment enough for some, but others yearned for more and went up higher to Krn’s mountaintop. 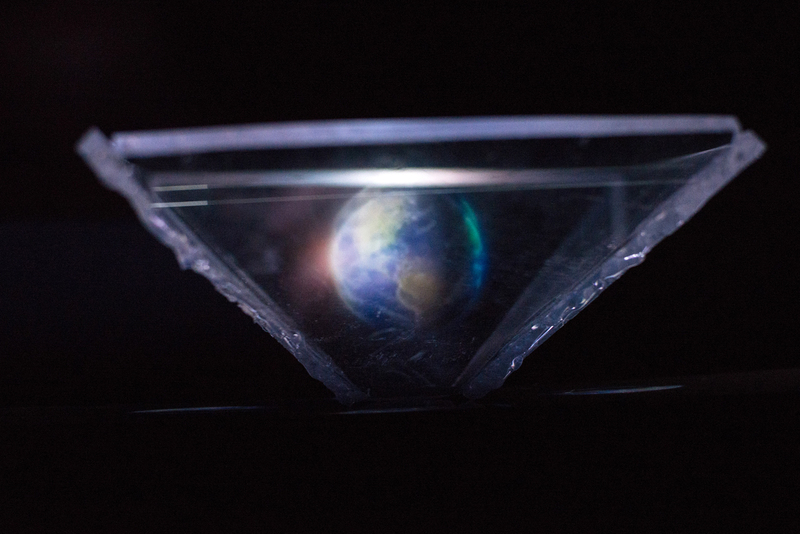 The future of mankind, the importance of mutual trust, of investing in the development of our social skills and of staying grounded in reality informs the project by multimedia artists İpek Burçak in Eren İleri. A remote location right beside the main PIFworkspace serves as a location for their installation Secure Shell. It will provide a safe space for its user. Interaction with a device providing imagery and curated texts on screen will invite him to enter into a mind-provoking solitary contemplative state. There he will ponder the possibilities of resisting and actively working against the distribution of power and capital, as we find it in today’s world. Our fermentation team intent on preparing a diverse range of foods (kimchi, tempeh etc.) continues to provoke discussion about the food and eating habits of the future. Fermented foods should definitely be an integral part of a balanced diet, as they help digestion, strengthen our immune system and contribute greatly towards our bodily and mental well being. PIFcamp 2018 – All Is One! Nowadays, easy access to a Wi-Fi is a given. Connecting to one means receiving arbitrary and basic information about the of the network. What if it wasn’t so arbitrary? Could we use it to send meaningful messages? Make ones day with a beautiful verse, a humorous pun? Could we overtake the network provider’s list and incite people to think, act? 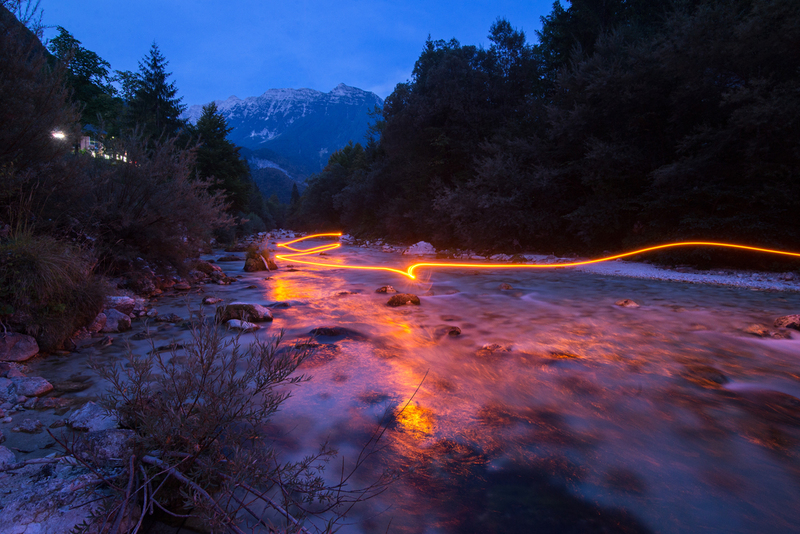 The possibility is explored in this potentially highly activistic project named Hot Ninja by Dmitry Morozov. 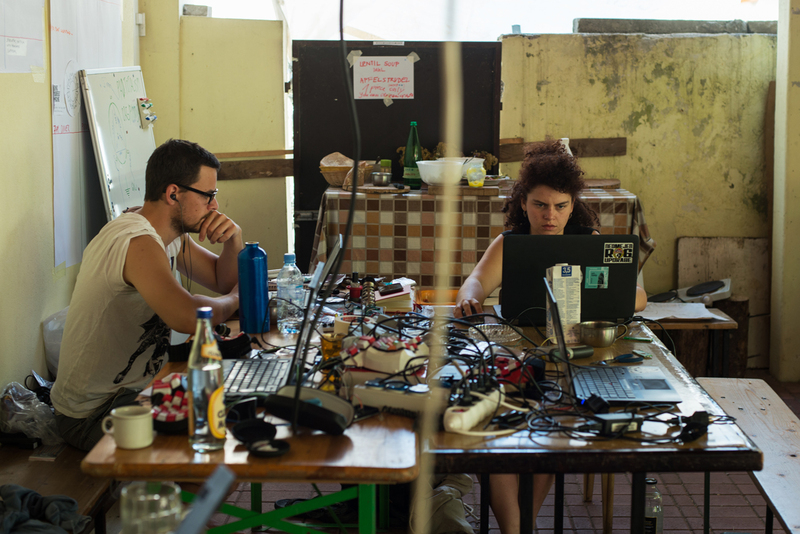 The blazing sun doesn’t seem to mind PIFcampers, as every day they get evermore increasingly absorbed in their work. 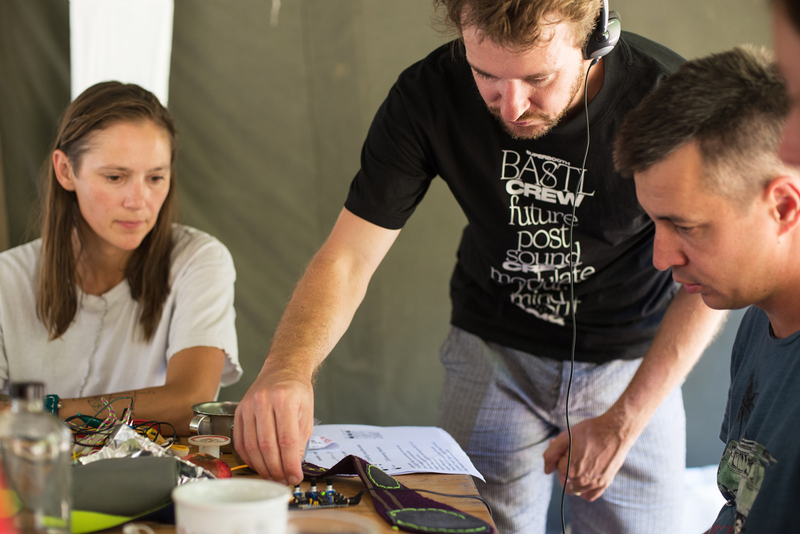 Lovrenc Košenina and his team continue work on their custom weather station, which features temperature, moisture, UV, atmospheric pressure and wind sensors. The gathered data will be readily available online. Several textile projects are also in the course of being completed. Maggie Kane, who hails from the USA, works on her MIDI controlled smart jacket inside the house, but she’s not the only one with a smart jacket project. 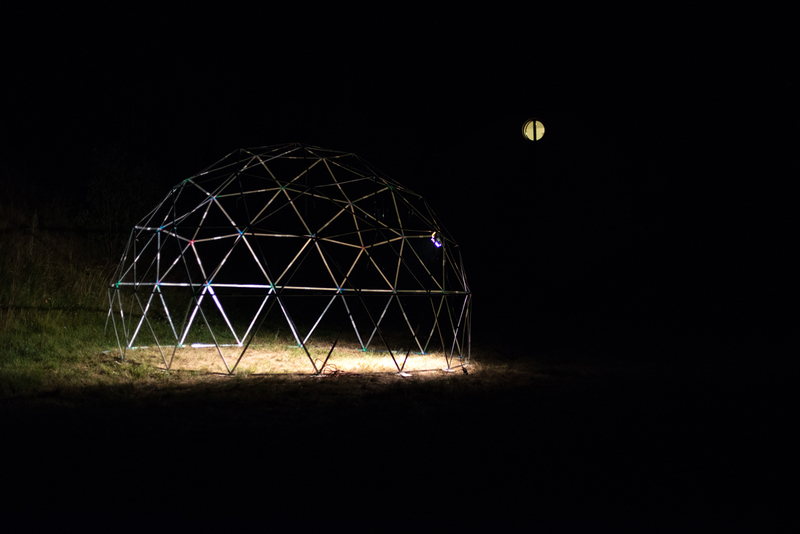 Another one is being built by Sanja Hrvaćanin and Eva Pondrk. It’s designed with cyclists in mind, as it features lighting and signalling devices, which will increase their visibility in traffic, as well as notify other drivers about the cyclist’s intended travel direction. 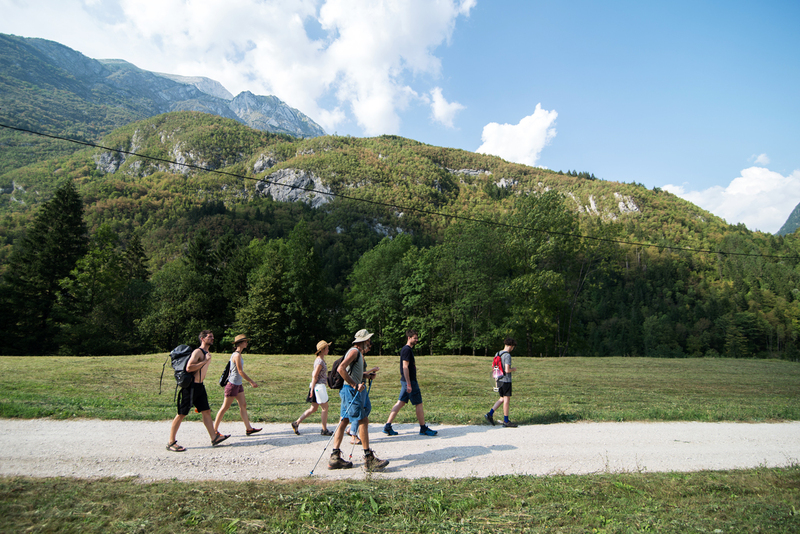 Soča remains the go to place for socializing and cooling down. The serenity of the riverbank induces one to slow down. To better cope with our daily stress and freezing water temperatures, potential inflammations, build up our energy and focus more mindfully on the present, Tilen Sepič, who is a part of the PIFvideo team, introduced breathing sessions in the daily routine of the PIFgroup. The sessions are is based on the method developed by Wim Hof. An improvised etching station was set up by Michael Page and Staš Vrenko in the afternoon. It seems there is always somebody eager to learn and create his own unique PCB. 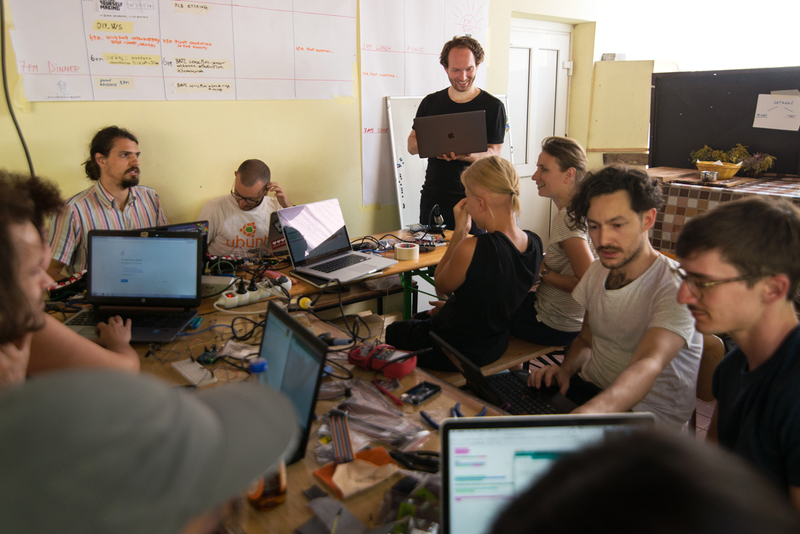 To facilitate and amplify our capabilities of sensing the processes at PIFcamp , be it the ones we initiate ourselves or those from our surroundings, Vaclav organized a senseMini workshop. The various sensors needed were therefore completed in no time. 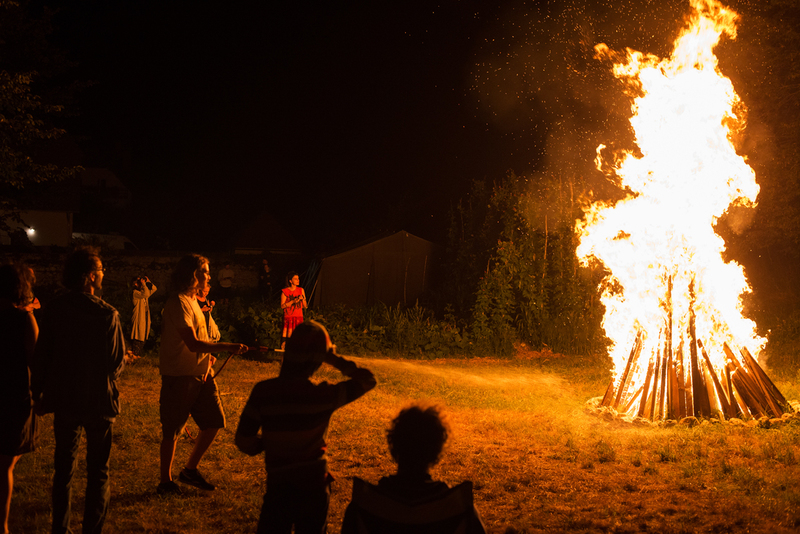 When the daily heat subsided, we were pleased warm our bones and feast our eyes on a bonfire. PIFcamp 2018 – So it Begins! 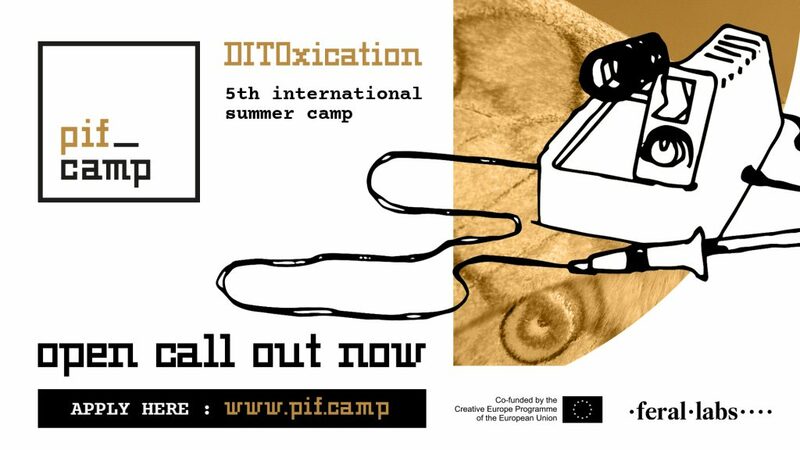 The fourth edition of the international hacking camp PIFcamp could do nothing but attract creatives, nature lovers, technology enthusiasts, art professionals, scientists and open culture advocates to the Alpine valley of Trenta once more. You can imagine that the promise of informed discussions, inspired activities, thought and skill provoking projects, new or renewed & brilliant friendships, as well as unforgettable adventures, collaborations and experiences in Slovenia’s Triglav National Park is more than enough to induce clever, daring, mindful and unselfish individuals to flock here from all corners of the world. 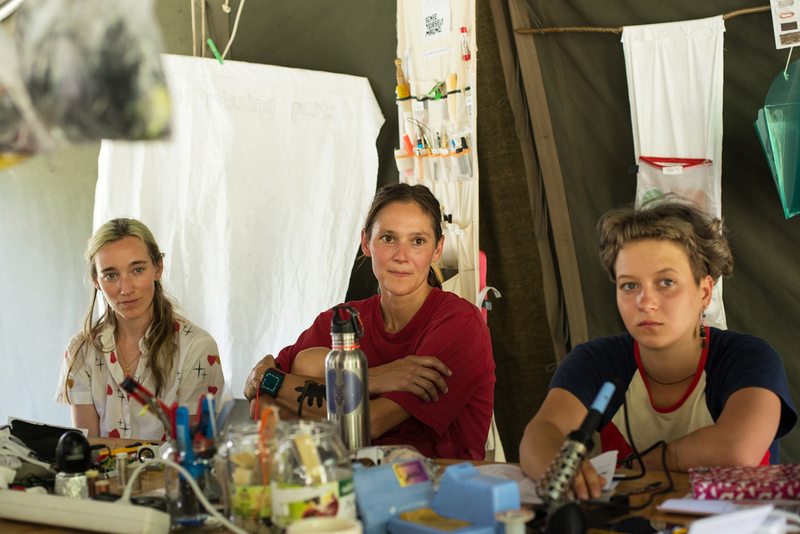 One of the several indicators of the camp’s success are all of its participants who have joyfully returned to have a second, third and sometimes even forth go. Nonetheless, there are enough new faces around to add to the excitement even further. But first things first! A mandatory dive into the what subjectively feels like freezing, yet incredibly enticing Soča river, a myriad of handshakes, introductions, laughs and a hefty meal before it’s off to work on the PIFprojects. This year’s projects and activities promise everyone will get to fully satisfy one’s inner nerd. 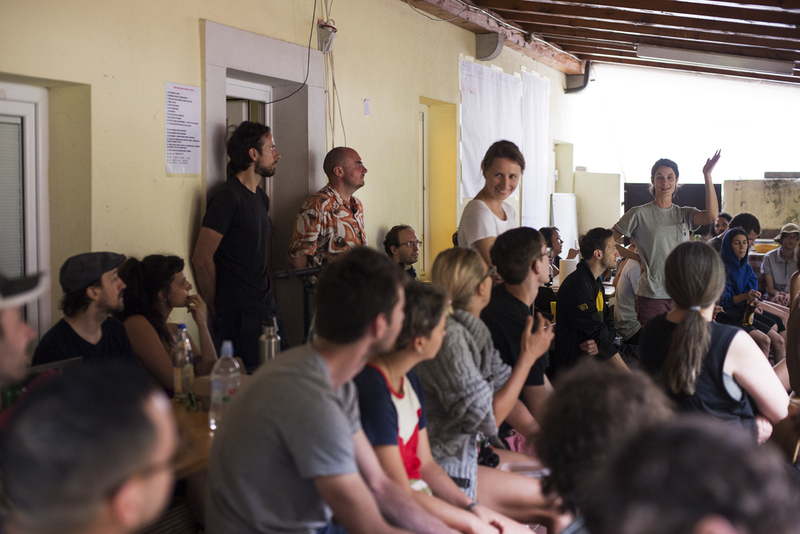 Hannah Perner-Wilson, our cherished Austrian multimedia artist, pedagogue, as well as a wearables and e-textiles researcher pitched her concept for a well thought-out and engaging project that definitely got our childlike probing juices flowing. Another PIFcamp bastion is undoubtedly BASTL Instrument’s Vaclav Pelousek, a modular synthesis professional who hails from Brno (CZ) and can’t fail to impress with his extensive list of planned activities, workshops and ideas, which are all informed by his broad understanding and his signature playful humour. We feel very fortunate to be able to include Dmitry Morozov ::vtol::, a Moscow-born and based new-media artist, musician, sound engineer and sound system designer with an impressive portfolio to our international PIFcamp family. While we hope to squeeze out as much knowledge from him as possible, he will work on developing his already beautiful and sometimes clandestine Mobile Terminal for Guerilla Communications. Fresh faces round out the roster of the local team. The recognized Slovenian new media artist, phenomenal VJ and awarded game developer Boštjan Čadež- Fšk promises to build Trivolan, an Omega 3 by Force Dimensions inspired, but accessible haptic interface for use in visual performances. Januš Aleš Luznar, a Slovenian electronic music producer working under the artist names Yanoosh and Ohm Fat will work on his Symphony of the Heart, a project that explores the effects of the heart beat and various images on our brain waves and the cardio-vascular system. 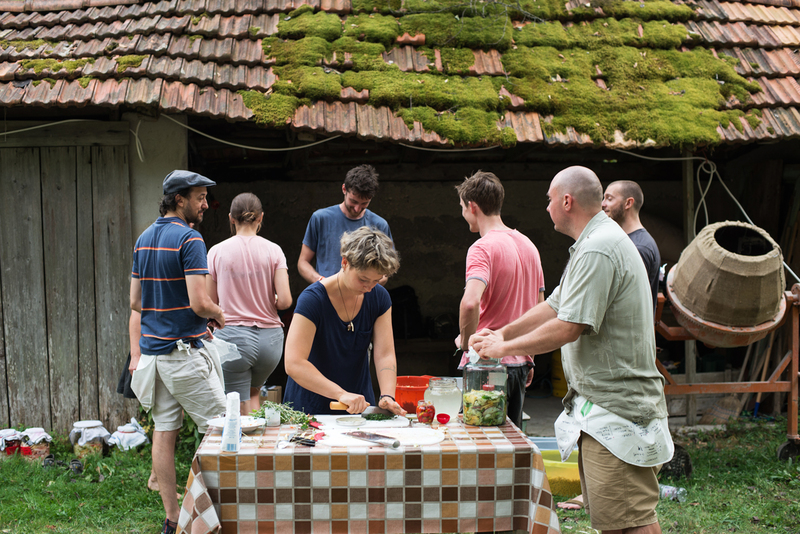 A staple of the PIFdiet remains hacking our food habits and therefore our own wild herbalist and botanist Dario Cortese has once again thought of a programme to test and impress our taste buds while not in or around the kitchen, store or the local market.